You may have heard of rainbow in a cup? If not it’s rainbow colored jello layered in a cup. 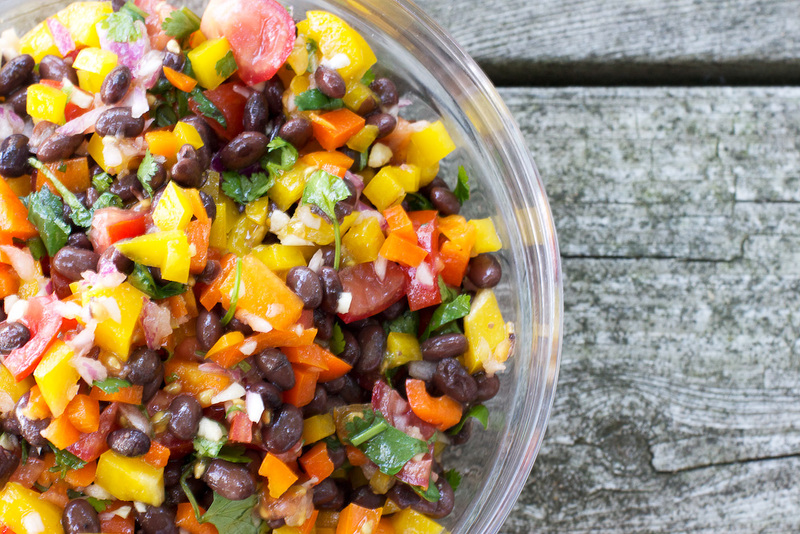 This salad is like rainbow in a cup only better. And healthier. And it’s so good you want to eat it in a bowl not a cup. 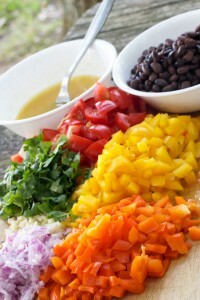 The only problem with this rainbow salad is that it’s missing blue (and indigo if we are going to get technical). I just couldn’t think of anything blue to put in it except blueberries and that wouldn’t be acceptable. Nothing against blueberries. I just don’t see them going well with cumin or mustard. 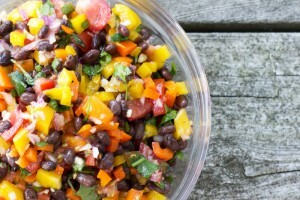 So pretend the black beans are really blue beans and you can have a full on rainbow inspired salad. It’s a perfect salad to bring along to that Memorial Weekend BBQ this weekend. 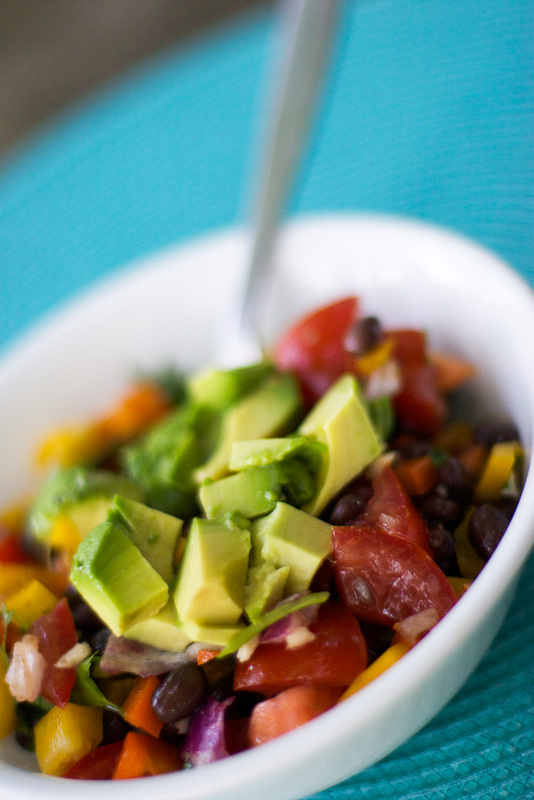 Mix all salad ingredints in a bowl. 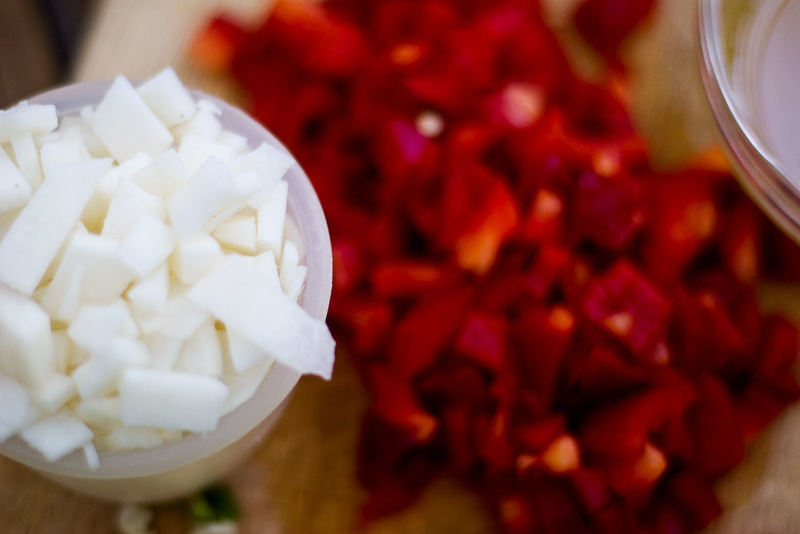 In a seperate bowl, whisk together the dressing ingredients. Toss the dressing with the salad. *My first attempt at pictures didn’t turn out but when I made the rainbow salad again I forgot the jicama. So know it tastes just as good without the jicama. The jicama just gives it a nice crunch. If you want to add some “gold” to the end top of this rainbow salad toss in some chopped avocado. Yum. Be inspired to follow your dreams at New School Nomads as we take a year long RV road trip through the United States! Rice vinegar! That’s what I’ve been meaning to get but keep forgetting. I see so many good recipes that call for it. Thanks for posting because just earlier I was racking my brain trying to remember! I’m buying some today!! Love the cumin and the mustard in the dressing! I hope you like it! Enjoy your weekend!! WOW, that looks gorgeous, and simply yummy. I am soo going to make this! I made a bowl Rainbow salad this weekend and it was Delish! Thanks for posting the recipe.